(FORTHCOMING 11 APRIL 2019): Build A Thing Of Beauty is available as a digital album online; the only physical release of the album, however, is an interactive musical sculpture known as the SCI★FI★HI★FI. Built in collaboration an electronics engineer (Peter Reid), metal worker (Mark Reynolds), antique format specialists (Aleks Kolkowski and Duncan Miller), and software coder (Owen Green), the SCI★FI★HI★FI is what its name suggests: a science-fiction inspired hi-fi system that can play seven of the most historically significant recording formats (Edison wax cylinder, 78 rpm disc, vinyl LP, cassette tape, compact disc, mp3 on hard drive, and streaming remotely from the cloud). It explores how playback technology changed the parameters of musical work at different moments in history: from two minutes of lo-fidelity mono sound on wax cylinder, to a streamed AI-composed remix that is unstoreable and infinite in length. Thanks to the Arts and Humanities Research Council for supporting this component of my work! 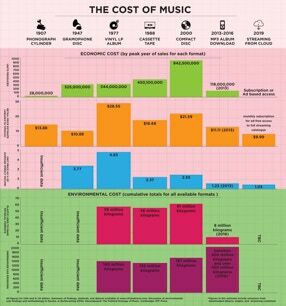 The “Cost Of Music” is a collaborative research project between Matt Brennan and Kyle Devine. It also involves a film collaboration with Graeme O’Hara and a fanzine collaboration - “Terrifying Miracle Of Recorded Sound” - with Jude Thompson. Full findings, datasets, sources, and methods for the economic cost of recorded music of the research can be downloaded from the University of Glasgow here. Full findings, sources, and methods for the environmental cost of recorded music can be found in collaborator Kyle Devine&apos;s forthcoming book, Decomposed: a political ecology of music (2019, MIT Press). The instrument pictured above is the product of a collaboration between Brennan and David C. Frazier, an artisan blacksmith from Arkansas. Inspired by the homespun aesthetic of one man bands, Brennan and Frazier spent several weekends in a workshop on the south side of Glasgow building a one man band instrument out of a suitcase, a skateboard, and scrap metal. 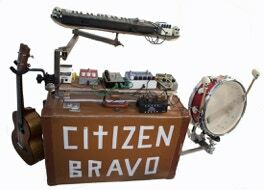 The resulting contraption was wheeled out for a series of unruly live performances where Brennan road tested the songs that he would eventually bring into the studio. Matt sometimes writes books about music. His most recent book, When Genres Collide, was named as one of Pitchfork&apos;s"Favourite Music Books of 2017."